At a distance of 155 kms from Delhi, Vrindavan is a holy town situated on the banks of river Yamuna in Mathura district of Uttar Pradesh. Vrindavan is a major pilgrimage center for Hindus and is one of the oldest cities in the country. The holy town of Vrindavan has a very rich history associated with Lord Krishna. It is said to be the place where Lord Krishna spent his childhood. Vrindavan houses many old temples and here we are going to look at 12 must visit temples that are worth visiting. With a very close proximity from Vrindavan Railway Station, Prem Mandir is one of the must visit temples in Vrindavan dedicated to Lord Sri Krishna. The temple structure was established by the spiritual guru Kripalu Maharaj. The presiding deities are Sri Radha Govind and Sri Sita Ram. ISKCON Temple also known as Sri Krishna Balaram Mandir, is a popular temple situated in Raman Reti, Vrindavan. It was the first temple to be constructed by International Society for Krishna Consciousness. The presiding deity of the temple is Lord Krishna Balaram. Sri Banke Bihari Mandir is one amongst the popular temples in Vrindavan, which is situated near to Radhavallabh Temple. This temple is among the 7 temples of Thakur of Vrindavan including Sri Radhavallabh Ji, Sri Govind Ji and four others. The presiding deity in the temple is of Lord Krishna in the standing posture. Shri Ranganath Temple is one of the biggest temples in the region. It is dedicated to Lord Vishnu and his consort Lakshmi. The temple is built in the South Indian architecture with eight towers built in the Dravidian style. The Govindji Temple is an astonishingly beautiful seven storey temple dedicated to Govindji. The temple reflects the architectural elements of Western, Hindu and Muslim style. The temple was designed in the form of a Greek cross and made with red sandstone. It is one of the recently built temples in Vrindavan in the honour of Goddess Vaishno Devi. The highlight of the temple is the 140+ft tall image of the eight armed Maa riding a 50 ft tall lion with Hanuman seeking the blessings of the goddess. At a distance of 2 kms from the Vrindavan Railway station, Sri Radha Ramana temple is one amongst the seven temples dedicated to the Thakur of Vrindavan, which includes Sri Radhavallabh Ji, Sri Govindji, Sri Banke Bihari Ji and three others. Sri Radha Damodara Mandir is an ancient temple situated at Loi Bazar near Seva Kunj in Vrindavan. The temple was established in 1542 A.D., but during the attack of Aurangzeb the idols were shifted to Jaipur and were brought back in 1739 A.D. The temple was constructed around 1626 AD, by a Bengali devotee. The soldiers of Aurangzeb desecrated this temple in 1670.The deity of Radha-Ballabha was taken for a while to the town of Kaman, and returned in 1784. There is no deity of Radharani in this temple. A crown is placed on the altar and this is used for Radha's worship. The temple is considered to be one of the Shakthi Peeths in India. When Sati jumped into the Yagya which was organised by her father Daksha Prajapathi, it is said that Shiva danced with the body of Sati and the burnt parts of her body fell at various places. It is believed that the goddess's hair fell here. Vrindavan Chandrodaya Mandir is the world's tallest temple under construction in Vrindavan. At a cost of ₹300 Crores, it will be one of the most expensively built temples in the world by ISKCON. This temple was built by the Maharaja of Jaipur, Sawai Madhav, in 1917 after thirty years of hard labour. 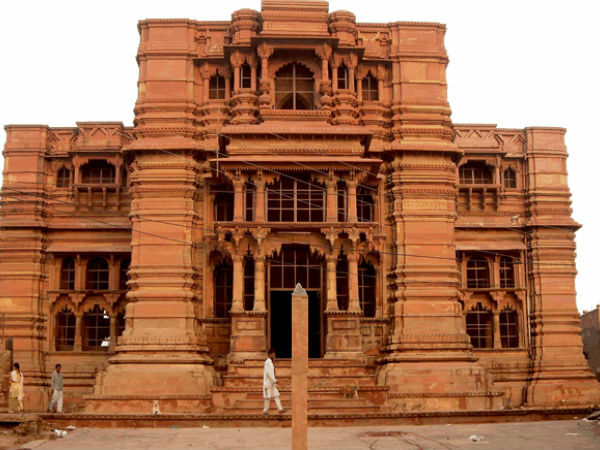 It is one of Vrindavan's most opulent and grandiose temples. The deities worshipped here are Sri Radha-Madhava, Ananda-bihari and Hansa-gopala.